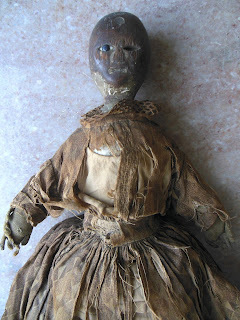 It is always nice to find an Antique doll in its original clothing. Presentation really is everything and Fine feathers do make the bird. So I particularly enjoy this doll (seated in the front of the picture) still in her original dress and unders from the mid 19th century. The doll and her clothing are entirely hand sewn. The dress has cartridge pleats at the waist, and at the top of the sleeve. The back closure has small brass hooks and eyes. Her pantalets display the lovely little Van dyke points. The delicate narrow lace has come loose from the neckline and the edges of her sleeves. The fabric is so delicate I do not want to handle it enough to stitch these back so I have just let them drape where they fall. Some one put hours into dressing this special doll 160 year or so ago! The shoes were apart but still all there. I chose to tie them in place with a silk ribbon rather than attempt any repair. The leather was too soft to sew at all. So the bows were a way to keep the shoes with the doll without changing or destroying anything. The doll herself is a rare type from an unknown maker. American surely, but we do not know who the doll maker was. 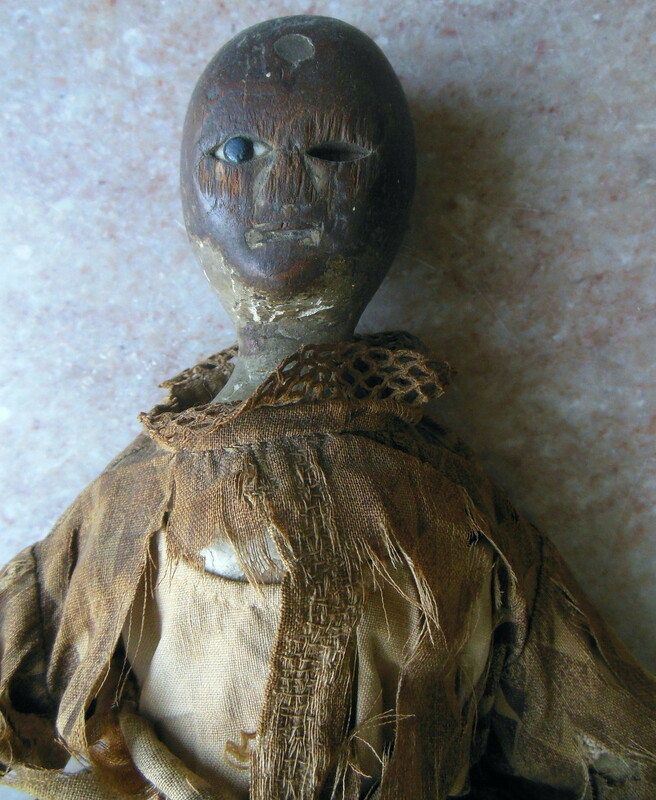 This type of doll is most often found in the northeast, I believe this one came from a home in New York state. She has a head of stiffened pressed cloth somewhat like the Izannah Walker dolls, but not nearly as sturdy. To see a more comprehensive article about this doll and a few others like her, go to "Maida"
Each year for some time, Trish and Dorothy have held a hooking retreat at a local inn here. With all the wool vendors and happy people and great projects it makes for an extremely colorful 2 day event. I was invited to visit and see all the rugs, a heartwarming thing with so many people I have known for years in attendance. Here are a few snaps. Veronica is working Barnyard Christmas from Barb Carroll. I wish I know more of the design names to credit. There are some really large rugs in progress, these women are not making doilies! Mary is working a great big one, she always displays such great color sense. 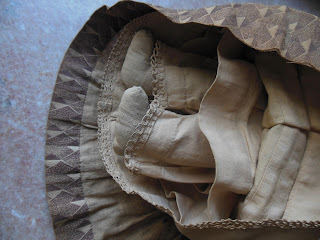 The small textiles made for dolls and children are a large part of my fascination with old dolls. The beautiful Handwork is a joy to examine. I purchased the baby's chemise for this large doll to wear, but she is disappointed that one of her slightly smaller sisters will get to wear it. The top and sleeves are trimmed with tiny points made with a strip of fabric turned back and forth and stitched down. My friend Rachael Kinnison says "~ the little Van Dyke points were quite popular thru the first half 19th c and well into the 1860s even." Rachael's beautiful blog is http://ladysrepositorymuseum.blogspot.com . I have pictured the chemise here on the large papier mache head doll it was a bit snug for. Most of our friends did not realize how Jack vetted and shaped our collection of furnishings for the old cape he gave so much of himself to restore. Occasionally some item would come to my attention and Jack would say firmly, "Not in this house!" Usually I was close to being on target with things that both of us loved. Jack and I were not wealthy, but we studied the Little's collecting and decorating at Cogswell's Grant and in our small way aspired to such a look in our cape. Jack was very assertive about his choices to live with. An example is our take on old blue Staffordshire. When I met him I had an extensive collection of it, 52 pieces as I remember. Some big platters with cows and chickens and farm scenes and a few better pieces but not historical blue. All of it had to go because it was not hand painted and early enough to suit him.. I hid one of my dear Staffordshire hens in the bottom of a cupboard. If I wanted blue, and I did, it needed to be Delft and we gathered a nice cupboard full of that, starting with a perfect and lovely early Delft plate his mama gave us. Just 2 years back we inherited Jack's mother's collection of blue Staffordshire china so I have a bit of it again, but the Delft is still the star in the living room. To be considered antique, a toy or doll does not have to be as old as the furniture and accessories that Jack and I preferred to collect. Our favorite furniture was early18th century and most of my doll family is from the mid to third quarter of the 19th. Jack was always considerate of my affection for the dolls and he made wonderful furniture for them and helped find and display (and pay for!) A great many dolls for me. But he did not want many of them in the living room or dinning room of our old cape with the "real" antiques.. In fact they were mostly confined to one small bedroom except at Christmas time when they were given the run of the house. Teddy bears are such Johnny come latelys that Jack had almost no tolerance for those. He would buy them for me, and even point them out at a show, but he had no liking for them. They did not GO. 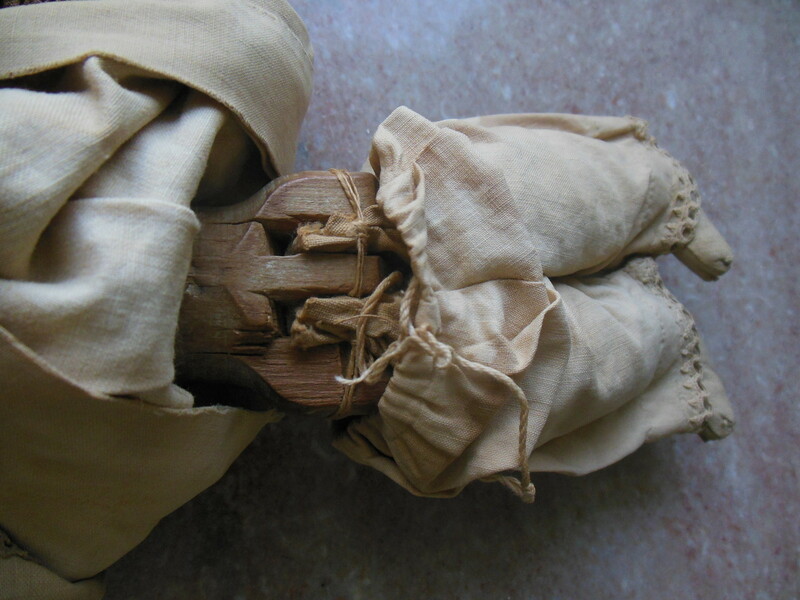 Later in our collecting, we realized that specializing in early wooden dolls would have been the proper course for us and the rest of our collection. It seemed far too late to take off on that path by the time I knew what dolls would "go". 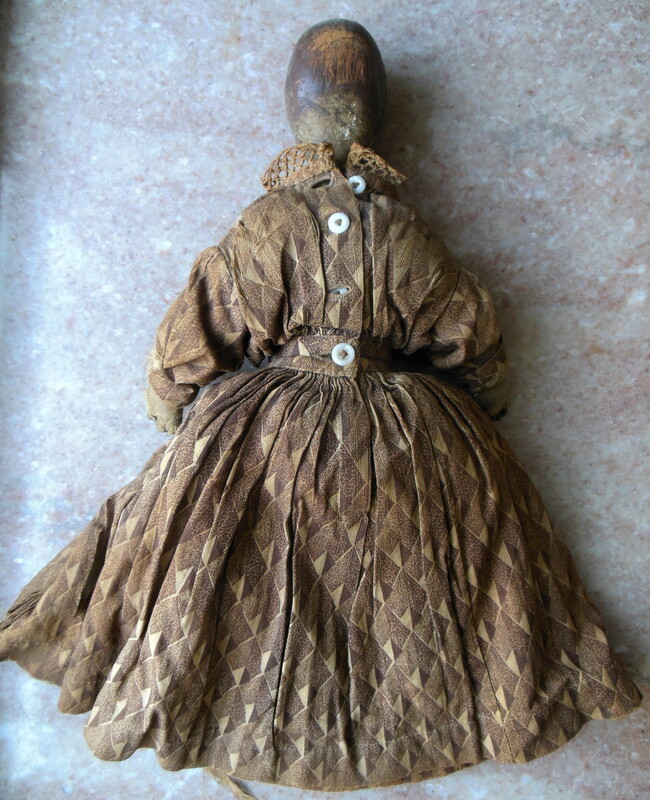 The earliest wooden dolls are often quite beautiful. Condition is as important in dolls as it is in any fine antiques. The ones I liked I surely had better not buy. Like many other things over time, the later woodens deteriorated in execution and were cruder from mass production even though still hand made. An extra few hundred thousand dollars would have let me set a number of pretty nice ones about, though not the earliest Higgs types. I do not come across them at antique shows any more now. 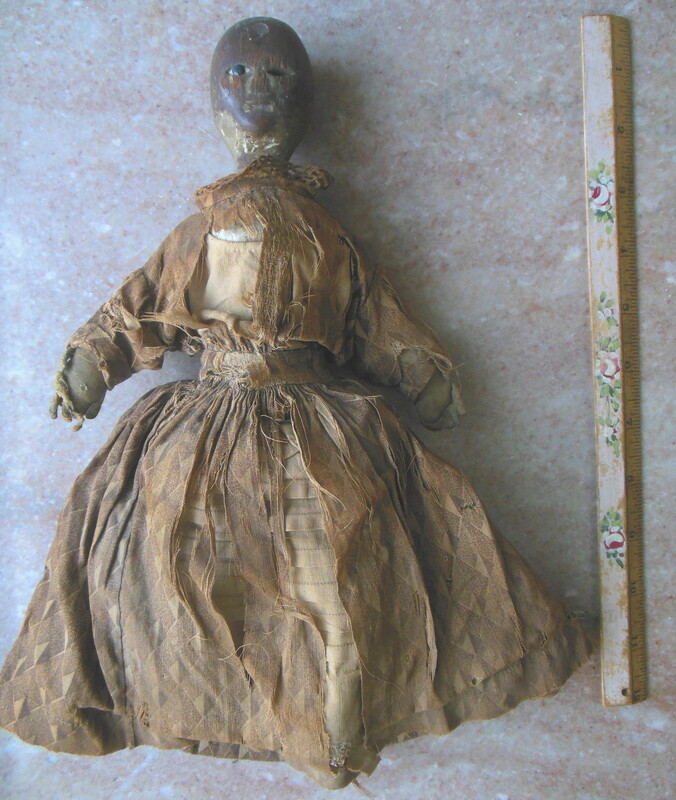 Here is a very old doll who has a long memory and has had a full "life". Should we say existence? In my mind their time lines are lives to an extent. It is enjoyable to try to read some of her story. When Jack and I had just moved into this home last year, Jan and Bill Borron came one day bringing a Little Gem Magnolia plant. Both Jack and Jan were gone in December without ever seeing the plant take hold well. There was a nice local auction yesterday, and I previewed it the day before and went yesterday prepared to win a few things. With my notebook and my checkbook and having studied prices on line, I felt loaded for bear! The auction goods were from the estate of lifelong collectors and included many things I have never seen before or at least not focused on in all our time of chasing antique Americana. One such was a pair of hand crocheted Horse bonnets. These affairs were mesh like with tassels and soft pompoms just over the horses' eyes and worn to keep flies away from the ears and eyes. The bonnets covered just the top third or so of a horse's head. I hope these will end up in a museum somewhere. The furniture offerings included a good bit of Federal style, but also pieces more to my taste like a nice Q A chest on frame, a drop front desk and a lovely tall case clock. All brought appropriate prices from a crowded hall. Texas History books were enthusiastically bid up and out of sight! I bid on none of the above, saving my funds for the things I intended to purchase. There was a great Heriz I wanted for the living room, but my offering of 2100 was left behind in the dust. And it went to a prominent dealer who should double on it. There was an old Santa Clause German Candy container much distressed and 32 inches tall! I wanted that but was under bidder on it. There was a dear little basket I suspect is shaker, but Virginia was not there to assure me so I dropped out at 310. It was a finely woven lidded very shapey darling about 5 inches tall including the handle. 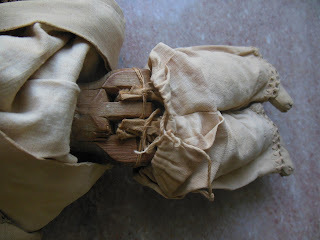 There was a note inside of it's ownership and family connection dating it long back, but the basket wore it's provenance well enough in the nut brown coloring of the incredibly fine splint without a flaw that I could see.